Subepithelial immune complex deposition in the glomerulus is thought to be caused by two different mechanisms, as follows: unspecific accumulation of Igs in the glomerular capillary (such as in systemic lupus nephritis and membranoproliferative glomerulonephritis) or specific binding of Igs to podocyte-associated targets (such as in membranous nephropathy). Membranous nephropathy is the most common cause of adult nephrotic syndrome in Caucasians, and approximately one-third of the patients progress to renal failure (1, 2). The etiology of human membranous nephropathy has remained an enigma for the last decades. The prototypic subepithelial deposition of membranous nephropathy has been studied in rat experimental models such as the active (3) and passive (4) forms of Heymann nephritis (HN and PHN, respectively). These models display many features of human disease (5) and have substantially contributed to our current understanding of the disease. PHN is induced by injection of heterologous antiserum from sheep immunized with a crude extract of proximal tubular brush border from rat kidney (4). One target of this antiserum is megalin, which is localized on the basal surface of podocyte foot processes in rats (6, 7). Megalin, however, is not expressed in human podocytes or in subepithelial deposits in patients with membranous nephropathy (8). Other podocyte–membrane proteins, such as neutral endopeptidase (NEP) (9), aminopeptidase A (10), and phospholipase A2 receptor (11), were identified as Ag targets in membranous nephropathy in rabbits, mice, and humans, respectively. Anti-NEP Abs were later shown to induce neonatal membranous nephropathy with formation of subepithelial deposits in second children of NEP-deficient mothers who had apparently been immunized by intact NEP from their first child (12, 13). However, NEP autoantibodies are found only in a very small number of patients with membranous nephropathy (12), and aminopeptidase autoantibodies have not been described in humans. Phospholipase A2 receptor is present on human podocytes, and Ab levels seem to correlate with membranous disease activity (11), but clearly not all patients with membranous nephropathy also have phospholipase A2 receptor Abs in their serum (11). Definite proof of principle is lacking because phospholipase A2 receptor is not expressed on murine podocytes. In summary, the Ag on human podocytes remains at least partly unknown. It has been speculated that the Ag is localized on the basal aspect of the podocyte foot process (14) and that local microinflammation at the site of Ag/Ab recognition contributes to podocyte damage (15). Histologically, the development of subepithelial glomerular basement membrane (GBM) deposits that contain IgG and complement is the hallmark of rat and human disease. Until recently, complement activation and C5b-9 membrane attack complex formation at the podocyte were thought essential to the development of PHN (16, 17). However, PHN can be induced in complement 6-deficient rats (PVG C6−/−) that cannot activate the complement cascade to form C5b-9 membrane attack complex (18). The same rats were used to show that HN is not complement dependent (19). Recently, we presented a mouse model of immune-mediated podocyte injury in which a polyclonal rabbit anti-podocyte antiserum was used to induce massive proteinuria in mice (20). We proposed that differentiated, cultured murine podocytes expressed specific Ags that would lead to the generation of anti-podocyte Abs after injection into rabbit, similar to the development of anti-FX1A Abs in PHN. Rabbit anti-podocyte serum injection into mice induced massive proteinuria in a prolonged fashion, but subepithelial deposits were not observed (20). Because of limited quantities of rabbit anti-podocyte serum, the same approach was now used to generate sheep anti-podocyte antiserum. In addition, a murine podocyte cell line from Schiwek et al. (21) was used as Ag for sheep immunization instead of podocytes by Mundel et al. (22) as these cells more stably express podocyte marker proteins such as nephrin in culture upon differentiation. To our surprise, the effect of the sheep antiserum on mice was profoundly different from the effect of rabbit antiserum. We find that injection of sheep anti-podocyte serum into mice induced severe nephrotic syndrome with podocyte foot process effacement and formation of subepithelial deposits. Several putative Ags were identified by mass spectrometry. This work summarizes the data obtained with the new mouse model and discusses similarities and differences with the rabbit anti-podocyte nephritis (APN) model and the rat model of PHN. Murine podocytes (provided by Endlich, Greifswald, Germany) (21) were cultured under permissive conditions (33°C, 5% CO2, RPMI 1640 supplemented with 10% FCS, 10 mmol/l HEPES, 1 mmol/l sodium pyruvate, 100 U/ml penicillin, 100 μg/ml streptomycin, 10 U/ml IFN-γ [PeproTech, London, U.K.]), as described (21). Human podocytes (a gift of Saleem, Bristol, U.K.) were cultured under permissive conditions (33°C, 5% CO2, RPMI 1640, 10% FCS, 1×insulin-transferrin-sodium selenium) and for differentiation under nonpermissive conditions (37°C), as described (23). For differentiation, both podocyte cell lines were cultured for 14 d under nonpermissive conditions (37°C, 7.4% CO2) in respective media, omitting IFN-γ for murine podocytes. Cell density was kept below 80% to allow process formation. Three sheep were immunized with murine podocytes. Prior to immunization, sheep were bled from the ear vein to obtain preimmune serum for control experiments. For immunization, a primary s.c. immunization with 1 ml murine podocyte cell suspension (∼10 × 109 cells) in 1 ml CFA (Sigma-Aldrich, Steinheim, Germany) was followed by four monthly boost immunizations of podocytes emulsified in IFA and serum titer assessments, as described before (20). One week after the final boost and monthly after reboosts, sheep serum was collected. Following removal of the blood clot, sheep anti-podocyte serum was centrifuged at 2500 U/min for 20 min. Serum was complement inactivated by heating (30 min at 56°C in a water bath) and concentrated 2-fold by high-pressure membrane filtration technique (Amicon stirred cell 8000 series; Millipore, Eschborn, Germany). IgG purification was achieved with the ImmunoPure IgG purification kit from Pierce (Bonn, Germany). Agarose-coupled protein A was bound to 2.6 ml centrifuged sheep serum in binding buffer in a column, according to the manufacturer’s instructions. After several washes with binding buffer, purified IgG was eluted with elution buffer in three fractions. The pH of all fractions was adjusted with 1 M Tris base to pH 8.0 before dialysis of IgG with PBS to remove elution buffer. IgG concentration was monitored with Gelcode (Pierce)-stained SDS-PAGE gels and Bradford tests. Generated Abs were tested by immunofluorescence on differentiated murine podocytes cultured on glass coverslips and by immunohistochemistry on paraffin-embedded mouse kidney sections (see below). Cells were fixed with 4% paraformaldehyde in 2% sucrose for 8 min. Specific binding of anti-podocyte serum to the cells was assessed by indirect immunofluorescence. Briefly, anti-podocyte serum was diluted 1:200 in 5% horse serum (Vector, Burlingame, CA) and incubated for 1 h at room temperature. Binding was visualized using an affinity-purified Cy2 donkey anti-sheep Ab (Jackson ImmunoResearch Laboratories, Soham, U.K.) diluted 1:200 in 5% horse serum for 30 min. Stainings were evaluated with a confocal microscope (LSM 510; Zeiss, Oberkochen, Germany) using the LSM software. Mice were housed in a controlled animal facility with free access to water and standard animal chow. All experiments were performed according to national and institutional animal care and ethical guidelines and have been approved by the local animal care committee. In a preliminary experiment, all three antisera were injected into C57BL/6N and BALB/c mice to compare the effects of the sera. In the following eight separate experiments with a total of 229 mice (n = 3–5 for each condition and time point), male C57BL/6N mice (25–30 g body weight, 12–14 wk old; Charles River, Sulzfeld, Germany) were treated with 300 μl concentrated sheep anti-podocyte serum injected into the tail vein. Control mice received equal amounts of concentrated sheep preimmune serum. Purified Ab was injected into mice in a 2-d scheme with 1.2 mg injected on day 1 and 1.6 mg injected on day 2. Mice were weighed and sacrificed on day 1–24 by cervical neck dislocation. Following the collection of blood, kidneys were perfused through the aorta with PBS. Kidneys were cut into equal pieces for histology and electron microscopy. Serum creatinine, urea nitrogen, cholesterol, and triglycerides were determined by standard methods in the department of clinical chemistry at the university hospital. Complement dependency was tested in one experimental series with C3-deficient C57BL/6N mice (24) and control C57BL/6N mice. Five C3-deficient and control mice were injected with 300 μl anti-podocyte serum, and four C3-deficient and control mice were injected with preimmune serum. All mice were sacrificed on day 11, and urine, serum, and kidneys were processed, as detailed above. Urine was collected for proteinuria from all mice on several days along the time course. Proteinuria was assessed by SDS-PAGE of mouse urine collected over 6–8 h in 96-well plates, as described before (20). Briefly, 5 μl urine were loaded in 4× lithium dodecyl sulfate (LDS) sample buffer onto a 4–12% graded Bis-Tris NuPage gel (Invitrogen, Karlsruhe, Germany) and run in 50 mM MOPS buffer for 1 h at 60 mA. Following electrophoretical separation, proteins were visualized by Gelcode (Pierce), according to the manufacturer’s instructions, and scanned. Urine albumin content was further quantified using a commercially available ELISA system (Bethyl), according to the manufacturer’s instructions, using an ELISA plate reader (BioTek; EL 808), as described (20). The urinary albumin concentration was calculated according to the formula for absorption = (A − D)/1 + (x/C)B + D), where A and D are values from the standard curve. Regression values for the standard curve with r values >0.9950 indicated accurate measurements. Urinary albumin values were standardized against urine creatinine values of the same animals and plotted on a logarithmic scale. Serum albumin was measured with the same mouse albumin ELISA system as detailed above. Whole blood was collected by aortic puncture and centrifuged for 5 min at 4°C at 1000 × g, and serum was separated for further analysis. ELISA plate readings were performed in triplicate. Immunoblots against sheep anti-podocyte Ab were performed with HRP-coupled donkey anti-sheep Ab (Jackson ImmunoResearch Laboratories). Lysis of cultured, differentiated murine podocytes was performed in tissue lysis buffer (T-PER; Pierce), followed by denaturation in LDS sample buffer (Invitrogen). Protein lysates were separated on a 4–12% Bis-Tris NuPage gel (Invitrogen) in 50 mM MOPS buffer for 1 h at 60 mA. Protein transfer to an activated polyvinylidene difluoride membrane (Millipore) was performed in transfer buffer (25 mM Tris base, 0.192 M glycine, 20% methanol in ddH2O) in a Novex Mini Cell (Invitrogen) for 1.5 h at 30 V and 4°C. The polyvinylidene difluoride membranes were blocked in 5% nonfat milk for 60 min prior to incubation with primary Abs diluted in Superblock blocking reagent (Pierce). Primary Ab was removed by washing in TBST for 40 min and detected by incubation for 45 min with HRP-coupled secondary Abs (Jackson ImmunoResearch Laboratories) diluted 1:15,000 in 5% nonfat milk. After washing in TBST for 40 min, protein was visualized with ECL SuperSignal (Pierce), according to the manufacturer’s instructions, on a Biomax Light Film (Kodak). This study was conducted according to the Declaration of Helsinki principles, with approval from the local ethics committee. Tissue samples were obtained from the renal register of the University Hospital Hamburg between 2005 and 2007. Cultured podocytes were fixed with 4% paraformaldehyde and 2% sucrose. Whole kidneys were perfusion fixed and postfixed in 4% buffered formalin for 24 h and embedded in paraffin (Medim Histotechnologie, Buseck, Germany). Sections were either stained by the periodic acid-Schiff (PAS) reaction or processed for immunohistochemical stainings. Tissue sections (1 μm) were deparaffinized and rehydrated. Ag retrieval was performed by incubation with proteinase type XXIV (5 mg/ml; Sigma-Aldrich, Steinheim, Germany, and St. Louis, MO) for 15 min at 37°C or by microwave Ag retrieval in citrate buffer (pH 6.1) for 25 min. After 30-min block in 5% horse serum (Vector), the tissue or cultured podocytes were incubated with primary Abs in 5% horse serum for 1 h at room temperature or overnight at 4°C. For immunofluorescence, binding was visualized using affinity-purified secondary Abs (Cy2 or Cy3 conjugated; Jackson ImmunoResearch Laboratories) diluted 1:200 in 5% horse serum for 30 min. For light microscopy, staining was visualized using biotinylated affinity-purified secondary Abs (Jackson ImmunoResearch Laboratories) diluted 1:400 in 5% horse serum for 30 min, followed by the ABC kit from Vector, according to the manufacturer’s instructions. For direct immunohistochemistry of mouse IgG and IgG isotypes, HRP-conjugated primary Abs (goat anti-mouse IgG [1:100; Biozol, Eching, Germany] and goat anti-mouse IgG1 and IgG2b [1:100 from Zymed Invitrogen]) were visualized using diaminobenzidine as a substrate. For indirect immunohistochemical evaluation of glomerular binding of anti-podocyte serum to naive kidney sections, preimmune sheep or APN sheep serum (7319, 7258, and 7789) was diluted 1:100. Primary Abs used were nephrin, synaptopodin (both 1:50; Progen), Cy3 donkey anti-sheep IgG, Cy2 donkey anti-mouse IgG (both Jackson ImmunoResearch Laboratories), laminin (1:400, CM6 hybridoma; Sigma-Aldrich), α–actinin-4 (clone Ig701; ImmunoGlobe, Himmelstadt, Germany), FITC anti-complement 3 (1:50; MP Biomedicals), rabbit anti-human CD3 (1:1000; DakoCytomation, Hamburg, Germany), rat anti-mouse Ly6G (1:50; Hycult, Uden, The Netherlands), rat anti–Mac-2 (1:1000; Cedarlane, Biozol), rat anti-F4/80 (1:400, BM8; eBioscience, San Diego, CA), and rabbit anti-human annexin 3 (1:100 immunofluorescence, 1:200 immunohistochemistry; Aviva Systems Biology, San Diego, CA). ToPro3 (Molecular Probes, Invitrogen) was used for nuclear staining in immunofluorescence, and hematoxylin was used for light microscopy. Stainings were evaluated under an Axioskop (Zeiss, Jena, Germany) and photographed with an Axiocam HRc (Zeiss) or by confocal microscopy with a LSM 510 meta microscope using the LSM software. Micrographs were analyzed with Photoshop software (Adobe). Overlapping green and red stainings (yellows) were digitally extracted, inverted, and converted to greyscale for visualization. For quantification of glomerular neutrophil (Ly6G), macrophage (Mac-2), and T cell (CD3) influx, inflammatory cells were counted in 50 glomeruli per mouse per condition in a double-blinded fashion at a 400-fold magnification in the respective specific stains. Macrophage influx (F4/80) in the immediate periglomerular region was quantified in 20 high power fields per mouse per condition in a double-blinded fashion. Values are expressed as mean ± SEM. A p value <0.05 was accepted as statistically significant using the unpaired Student t test. Mouse anti-sheep IgG Ab titers were measured, as described (25), by ELISA using sera collected at days 1, 3, 6, 9, and 14 of preimmune and anti-podocyte serum-injected mice and of untreated control animals. A n = 3 was experimented per time point and condition. In brief, ELISA microtiter plates were coated with 100 μl 100 μg/ml sheep IgG (Sigma-Aldrich, Taufkirchen, Germany) in carbonate–bicarbonate buffer overnight at 4°C. After blocking with 1% BSA in TBS, the plates were incubated with serial dilutions of mouse serum (1:20, 1:100, 1:500, 1:2500) for 1 h at room temperature. Bound mouse IgG was detected using peroxidase-conjugated goat anti-mouse IgG isotype Abs (IgG1, IgG2b; Zymed Invitrogen) or peroxidase-conjugated goat anti-IgG (Biozol) at 1:1000 and tetramethylbenzidine peroxidase substrate. Absorbance readings were performed at 450 nm on a spectrophotometer. Lack of cross-reactivity of the secondary Abs with sheep IgG was demonstrated by omitting the primary Ab. Glomeruli were isolated using Dynabead perfusion, as described (26). Total RNA from whole kidney slices or isolated glomeruli was prepared, as described previously (27), and reverse transcribed (Superscript II; Invitrogen) by the use of random hexamer primers (Invitrogen). mRNA expression was quantified with an AbiPrism NN8650 using SYBR green, as previously described (28). The primers against annexin-3 were exon spanning (forward, 5′-GTTTGATGCGAAGCAACTGA-3′; reverse, 5′-GGCCAGATGTTCATCCACTT-3′). The 18S primers (forward, 5′-CACGGCCGGTACAGTGAAAC-3′; reverse, 5′-AGAGGAGCGAGCGACCAAA-3′) were used as an internal control to correct for small variations in RNA quality and cDNA synthesis, essentially as described by AbiPrism. Amplicons of random samples for each primer pair were determined by automatic DNA sequencing to demonstrate the specificity of the PCR (data not shown). Relative quantification of gene expression was calculated using the ΔΔ cycle threshold method. Electron-microscopical analysis was performed on small cortical samples that were perfusion fixed in 4% buffered paraformaldehyde. Tissue was postfixed with 1% osmium in 0.1 M sodium-cacodylate buffer, stained with 1% uranylacetate, and embedded in epoxy-resin (Serva, Heidelberg, Germany). Ultrathin sections were cut (Ultramicrotome; Reichert-Jung) and contrasted with uranyl acetate in methanol, followed by lead citrate. Micrographs were generated with a transmission–electron microscope (EM10; Zeiss, Oberkochen, Germany). Immunoelectron microscopy was performed, as reported before (20). Briefly, paraformaldehyde-fixed cortical tissue was dehydrated and embedded in LR-White resin. Ultrathin sections were steamed for 1 h in citrate buffer at pH 9.0 (DakoCytomation) and blocked with donkey serum (Jackson ImmunoResearch Laboratories). Sections were then incubated with 12 nm colloidal gold-conjugated donkey anti-sheep IgG (Jackson ImmunoResearch Laboratories) overnight at 4°C, followed by contrasting with uranyl acetate and lead citrate. Representative micrographs were taken on a Philips electron microscope (EM201; Philips). Purified IgG was covalently coupled to agarose beads in a column using the AminoLink Immobilization Kit (Pierce), according to the manufacturer’s recommendations. Covalent binding of IgG to the beads was chosen to allow stringent washing and elution conditions without IgG loss from the column. Briefly, 7 mg sheep IgG per ml agarose was dialyzed with coupling buffer (0.1 M NaPi [pH 7.0]) to reduce unspecific amines before covalent coupling with coupling reagent (NaCNBH3 in 10 mM NaOH) and stacking in gravity-flow columns overnight at 4°C. Residual binding capacity of the agarose was quenched, and the columns were washed with washing buffer, PBS, and elution buffer (100 mM glycine [pH 2.5]) to prepare for binding experiments. Differentiated murine podocytes (6 × 108 cells) were lysed in nondenaturing T-PER (Pierce) lysis buffer and spun at 14,000 × g for 10 min at 4°C. The column was equilibrated with T-PER before lysate incubation at 4°C overnight. The column was then washed six times with lysis buffer and three times with PBS before fractionated elution of the bound proteins (100 mM glycine [pH 2.5]), followed by pH adjustment with TRIS base. The eluted proteins were further analyzed by one-dimensional or two-dimensional (2D) SDS-PAGE and Gelcode stain or Western blot analysis. Podocyte lysate or column eluate was dialyzed (Zebra Desalt Columns; Pierce) against ZOOM 2D protein solubilizer 1 (Invitrogen) to eliminate salt and detergents. In the first dimension, isoelectric focusing of 150 μg protein from a total podocyte cell lysate was achieved with pH 4–8 ampholytes at voltage gradient of 200–500 V in a ZOOM IPG Runner (Invitrogen). After isoelectric focusing, the IPG strips were equilibrated (0.375 M Tris-HCl [pH 8.8], 6 M urea, 20% glycerol, 2% SDS, and 130 mM DTT). For the second dimension, the strip was equilibrated with LDS and fit onto a ZOOM Gel (Invitrogen) for SDS-PAGE with 60 mA per gel using a PROTEAN II system (Bio-Rad). After electrophoresis, the gels were stained with Gelcode (Pierce), as described above. Molecular weights were determined by using a SDS-PAGE standard (Invitrogen). Stained gels were digitalized at 1200 dots per inch using a Canon Scanner and Photoshop software (Adobe). Protein identification was performed, as described recently (29). Protein spots from Gelcode-stained 2D gels were selected and excised manually using a clean razor blade. Digestion with trypsin and subsequent spotting of peptide solutions onto the MALDI targets were performed automatically in an Ettan Spot Handling Workstation (GE Healthcare, Uppsala, Sweden). For preparation of MALDI-TOF-mass spectrometry analysis, protein spots were destained and digested in the gel with trypsin (Promega) and extracted, as described (29). The MALDI-TOF measurement of spotted peptide solutions was carried out on a 4800 MALDI TOF/TOF analyzer (Applied Biosystems, Foster City, CA). The spectra were recorded in reflector mode in a mass range from 800 to 3700 Da with an internal one-point calibration on the autolytic fragment of trypsin. Additionally, MALDI-TOF-TOF analysis was performed for the five strongest peaks of the TOF spectrum after subtraction of peaks corresponding to background or trypsin fragments. After calibration, a combined database search of MS and MS/MS measurements was performed using GPS Explorer software v3.5 (Applied Biosystems). Peak lists were compared with the SwissProt database rel.54.6 restricted to mouse taxonomy using the Mascot search engine 2.0 (Matrix Science, London, U.K.). Peptide mixtures that yielded at least twice a Mowse score of at least 54 for SwissProt results were regarded as positive identifications. Values are means ± SEM; n refers to the number of animals or individual measurements in separate samples. Differences between multiple experimental groups were compared by Kruskal-Wallis analysis with posthoc analysis by Mann–Whitney U test. Paired Student t test was used to compare mean values within one experimental series. A p value <0.05 was accepted as statistically significant. Three sheep were immunized with whole podocyte preparation. One serum (7319) was chosen on the basis of several criteria, as follows: 7319 serum induced severe proteinuria and podocyte effacement in all treated mice in a preliminary experiment with C57BL/6N and BALB/c mice; immunohistochemistry revealed exclusive staining of the glomerulus in treated mice (Supplemental Fig. 1); cultured podocytes showed specific staining with the Ab; and immunoblots with podocyte lysate revealed a limited number of proteins identified by the Ab. Characteristic findings of the three antisera in treated mice are shown in Supplemental Table 1A. Proteinuria was heavier in BALB/c mice induced with 300 μl anti-podocyte antiserum 7319 compared with C57BL/6N mice, whereas characteristic morphologic findings of APN were similar in both strains (Supplemental Table 1B). In the following eight individual experiments, 229 mice were treated with 7319 sheep anti-podocyte serum or purified Ab from this serum. Urine of serum-treated and purified Ab-treated and control C57BL/6N mice was examined for proteinuria on SDS-PAGE gels (Fig. 1A, 1B). Mice injected with 300 μl on day 0 developed proteinuria on day 2. In these mice, proteinuria was further increased on day 8 with severe albuminuria at approximately day 11–14. Mice injected with 1.2 and 1.6 mg purified Ab on days −1 and 0, respectively, developed initial proteinuria on day 4. Thereafter, proteinuria remained stable until day 10 and increased further to maximal values on day 18. Albumin content was quantified using an ELISA for mouse albumin (Fig. 1C) and corrected for urine creatinine. Urine albumin/creatinine ratio did not increase in control mice and mice treated with preimmune serum of the same sheep that later produced the anti-podocyte Ab, whereas in mice treated with anti-podocyte antiserum, urine albumin/creatinine significantly increased by 2 log ranks. These mice also developed clinical signs of nephrotic syndrome with edema and ascites. Mice treated with anti-podocyte Ab were significantly heavier (31.2 ± 0.65 g) than mice treated with preimmune serum (28.9 ± 0.64 g, p < 0.05; Fig. 1D) on day 14. Serum albumin concentration was significantly lower in anti-podocyte serum-treated mice on day 14 (9.56 ± 3.51 g/l) compared with preimmune serum-treated mice (24.7 ± 2.8 g/l, p < 0.05; Fig. 1D). Serum cholesterol and triglycerides were also quantified along the time course and showed a significant increase in anti-podocyte serum-treated mice 9 and 14 d after injection, whereas preimmune serum-treated mice remained stable (Fig. 1E). Serum creatinine and serum urea nitrogen, measured in proteinuric mice on day 24, were not elevated in any of the treated groups (Fig. 1F). However, some severely ill mice that had received 300 μl anti-podocyte serum developed acute renal failure with maximal serum urea nitrogen at 61.5 mg/dl on day 14 (data not shown). Sheep anti-podocyte serum-treated mice develop nephrotic syndrome. A, Protein staining of a SDS-PAGE gel loaded with 5 μl spot urine collected on days 0, 2, 4, 9, and 14 from representative mice treated with 300 μl sheep preimmune serum (left) or sheep anti-podocyte serum (APN, right). B, Protein stain of a gel loaded with day 0, 4, 7, 10, 18, and 24 urine from representative mice treated with purified sheep preimmune Abs (left) or purified sheep anti-podocyte Abs (right). C, Quantification of albuminuria in control (●), or preimmune (▪) or anti-podocyte serum (▴, APN)-treated mice (n = 5) by albumin ELISA. Values were normalized against urine creatinine and are expressed as log × μg albuminurine/mg creatinineurine ± SEM. D, Left panel, Weight in grams of preimmune (PI) and anti-podocyte serum (APN)-treated mice (n = 5) on day 14. Values are expressed as ± SEM. Right panel, Serum albumin measured by albumin ELISA in preimmune (PI) and anti-podocyte serum (APN)-treated mice at day 14 (n = 5). Values are expressed as g albumin/l ± SEM. E, Serum cholesterol and triglycerides in preimmune and anti-podocyte serum (APN)-treated mice on days 0, 4, 9, and 14 (n = 5), as indicated in the legend. F, Serum urea nitrogen (left) and creatinine (right) of preimmune (PI) and anti-podocyte serum (APN)-treated mice on day 24 (n = 5). Values are expressed as mg/dl ± SEM. *p < 0.05. n.s., nonsignificant differences. For histology and immunohistochemistry, mice were sacrificed on day 11 (300 μl 7319 antiserum) or day 24 following administration of anti-podocyte or the same volume of preimmune serum or Ab, respectively. PAS staining showed predominantly glomerular disease in anti-podocyte serum- or Ab-treated mice (Fig. 2Ab, 2Ac) but not in control mice treated with the same amount of preimmune serum (Fig. 2Aa). In all anti-podocyte serum-treated mice, glomerular pathological changes showed a diffuse distribution. Glomeruli were enlarged without mesangial hypercellularity. Capillary diameters were normal, except for some heavily proteinuric mice treated with 300 μl antiserum that displayed some endothelial swelling. Podocytes were swollen (Fig. 2Ab, 2Ac insets), and the glomerular basement membrane was thickened. In heavily proteinuric mice, some tubules were obstructed by proteinaceous casts. Within the obstructed tubules, tubular epithelial cells were swollen and vacuolated, possibly due to endocytosis of protein (data not shown). Podocytes are severely damaged in anti-podocyte serum-treated mice. A, PAS in preimmune (a, day 14)-, anti-podocyte serum (b, day 14)-, or purified anti-podocyte Ab (c, day 24)-treated mice. Note hypertrophic podocytes in anti-podocyte serum- versus preimmune serum-treated mice (insets). Scale bar, 50 μM. B, Confocal micrographs of nephrin (a–c) and synaptopodin (d–f) immunofluorescence. Granular nephrin (b, c) and synaptopodin (e, f) staining was observed in anti-podocyte serum-treated mice versus linear staining in preimmune serum-treated mice (a, d, insets, respectively). Original magnification ×1000 (a,b, d, e) and ×4000 (c, f). C, Left panel, Quantitation of glomerular area in preimmune or anti-podocyte serum-treated mice. Right panel, WT-1–positive podocytes per glomerular section. *p < 0.05. Fifty consecutive sections in n = 5 mice for each group. D, Electron microscopy of glomeruli from preimmune (a, b) and anti-podocyte serum-treated mice with mild (c, d) or strong proteinuria (e, f). Note the subepithelial deposits in d and f (black arrows) beneath effaced foot processes. Original magnification ×6,300 (a, c, e) and ×10,000 (b, d, f). Immunofluorescence of the podocyte-specific proteins nephrin and synaptopodin showed a linear staining pattern along the GBM in preimmune serum-treated mice (Fig. 2Ba, 2Bd, respectively). In anti-podocyte serum-treated mice, both proteins were found in a granulated pattern along the GBM and internalized into the cytosol of podocytes (Fig. 2Bb, 2Be). The linear staining pattern was completely abolished (Fig. 2Bc, 2Bf). Glomerular size was measured on day 24 in 50 glomeruli of three mice that were treated with either anti-podocyte serum or preimmune serum. Glomerular size increased significantly in anti-podocyte serum-treated mice (3770.5 ± 114.1 μm2) when compared with preimmune serum-treated mice (3062.8 ± 18.3 μm2, p < 0.05; Fig. 2C, left panel). Podocyte number per glomerular section was calculated from 50 glomerular sections per mouse; podocyte nuclei were stained with Abs against WT-1, as described before (20). Because in sheep serum APN glomerular area was significantly different in anti-podocyte serum- and preimmune serum-treated mice (in contrast to rabbit anti-podocyte serum nephritis), podocyte number was expressed as podocytes per glomerular section, not as podocytes per glomerular area. Quantification of podocytes per glomerular section revealed a significant decrease in podocyte number in Ab-treated mice compared with control mice (6.24 ± 0.18 and 7.72 ± 0.12, respectively; Fig. 2C, right panel). Together, these data suggest a loss of podocytes from the glomerular tuft in sheep serum APN. Transmission electron microscopy of proteinuric mice revealed swollen podocytes with segmental foot process effacement of 60–80% of all foot processes (Fig. 2Dc–f), whereas preimmune serum-treated mice showed normal glomerular structure (Fig. 2Da, 2Db). Interestingly, subepithelial deposits were present in most areas with foot process effacement. These pathological changes were observed in mice with massive (Fig. 2De, 2Df) as well as mild proteinuria (Fig. 2Dc, 2Dd). Similar deposits were present in the mesangial hinge region (Fig. 2Dc, 2De). In all mice, the GBM was well preserved. Some endothelial cell swelling was observed in mice with strong proteinuria. The in vivo binding pattern of the sheep anti-podocyte Ab after i.v. injection was highly specific on all days examined (Fig. 3A). Staining of mouse kidney sections with anti-sheep IgG Ab detected the injected anti-podocyte Abs only in the glomeruli at all time points analyzed. Within the glomerulus, immunostaining was detected in a linear pattern along the glomerular filtration barrier (Fig. 3Aa) and partly colocalized with the GBM protein laminin (Fig. 3Ab, 3Ac). Sheep preimmune serum was not detected within the glomerulus (Fig. 3Ad–f). Glomerular endothelial cells, podocyte cell bodies, or tubular cells were not stained. Localization of injected sheep anti-podocyte Ab in anti-podocyte serum-treated mice on day 7. A, Confocal micrographs of triple immunofluorescence against injected sheep anti-podocyte Ab (APN, a) or injected sheep preimmune serum (preimmune, d) and laminin (b, e) and nuclei (Topro-3, c, f). Scale bars, 50 μM. B, Immunogold electron microscopy of injected sheep anti-podocyte IgG 1 h (a, enlarged in b), 1 d (c), and 7 d (d) after injection. Arrows indicate gold particles at or next to podocyte foot processes. Original magnification ×10,000 (a) and ×32,000 (b–d). By immunogold labeling, sheep IgG was detected on and next to podocyte foot processes and in all layers of the GBM 1 h, 1 d, and 7 d after anti-podocyte serum injection, when podocyte architecture was still intact (Fig. 3B). Weak labeling was also detected in the primary podocyte processes on day 7. Endothelial cells, mesangial cells, mesangial matrix, tubular epithelial cells, and all other cortical basement membranes were negative. Immunostaining of sections from anti-podocyte Ab-treated mice with Abs against mouse IgG demonstrated glomerular mouse IgG deposition in a linear and granular pattern along the GBM in partial overlap with laminin (Fig. 4A). In addition, some IgG clusters were observed within the mesangium. 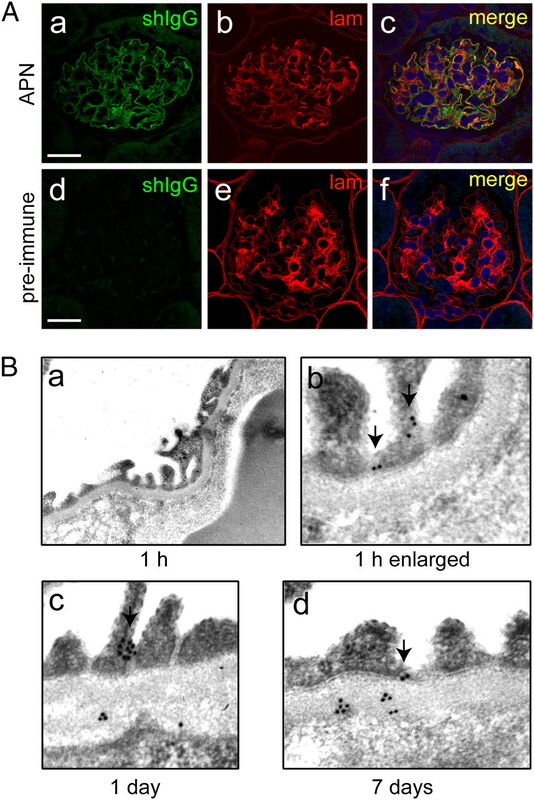 Confocal microscopy showed colocalization of mouse IgG with laminin and substantial amounts of mouse IgG outside the GBM, most likely in the subepithelial space (Fig. 4Ag, 4Ah). Mice injected with preimmune serum showed minimal mouse IgG reactivity (Fig. 4Ai–l). To further localize mouse IgG, costainings with the podocyte foot process protein α–actinin-4 were performed (Fig. 4B). Again, partial overlap of mouse IgG and α–actinin-4 was observed, with additional mouse IgG staining inside of α–actinin-4, toward the GBM. Together, these stainings indicate that mouse IgG is deposited in the subepithelial space in a linear pattern together with small granules along the GBM. Mouse IgG subclasses directed against sheep IgG were further studied by immunostaining and ELISA of serum samples along the time course (Supplemental Fig. 2). By ELISA, serum total mouse anti-sheep IgG, IgG1, and IgG2b increased to a maximum at day 6 or 9 and decreased at day 14. However, the observed increase was identical in anti-podocyte serum- or preimmune serum-treated mice. In contrast, immunohistochemistry showed significant mouse anti-sheep IgG, IgG1, and IgG2b deposition only in the glomeruli of anti-podocyte serum-treated mice and not in preimmune-treated mice. Therefore, serum mouse IgG reaction was unspecific to the sheep IgG load, whereas glomerular deposition was specific for anti-podocyte serum. Localization of mouse IgG deposits in anti-podocyte serum-treated mice on day 7. A, Confocal images of triple immunofluorescence against mouse IgG (a, e, i), laminin (b, f, j), and nuclei in APN serum (APN, a–h) or sheep preimmune serum (preimmune, i–l), as indicated. Yellows in c, g, and k were converted to greyscale in d, h, and l to demonstrate partial colocalization of mouse IgG and laminin. Arrows in e point toward small granular IgG deposits. The boxed areas in g are shown as insets in h to demonstrate IgG deposition on the outside (o) of the GBM (subepithelial space), whereas laminin shows singular staining also on the inside (i), or capillary side of the GBM. Scale bars, 50 μM (a, i) and 10 μM (e). B, Similar micrographs of mouse IgG, α–actinin-4, and nuclear costainings, as indicated. The boxed areas in g are shown as insets in h to demonstrate mouse IgG deposition on the inside (i) of α–actinin-4 staining (subepithelial space), whereas α–actinin-4 can be detected as a singular staining also on the podocyte (outside, o). Scale bars, 50 μM (a) and 10 μM (e). To investigate the role of complement activation in the sheep antiserum-induced APN, C3-deficient mice were treated with anti-podocyte serum or preimmune serum. The C3-deficient mice cannot activate the complement cascade beyond the initiation of the classical pathway and are unable to activate the alternative pathway of complement activation. We have found that the C3-deficient mice treated with anti-podocyte Ab were not protected from glomerular injury (Fig. 5). PAS staining showed similar histology with swollen podocytes and APN in C3-deficient and control mice (Fig. 5Ab, 5Ad, respectively). Immunostaining with Ab against mouse C3 showed C3 deposits along the GBM in control anti-podocyte serum-treated mice and background staining in preimmune serum-treated mice (Fig. 5Ag, 5Ah). In contrast, C3 was completely absent in kidneys of C3-deficient animals (Fig. 5Ae, 5Af). Similar destruction of nephrin staining was observed in C3-deficient and control mice after treatment with sheep anti-podocyte Ab (Fig. 5Aj, 5Al, respectively), indicating that complement activation was not necessary for podocyte disruption. APN is independent of C3. A, Histology on day 11 of complement C3-deficient (C3−/−) and control (C3+/+) mice treated with preimmune (PI) or anti-podocyte serum (APN), as indicated. Upper panels, Light micrographs of PAS (a–d) demonstrate equally diseased glomeruli in anti-podocyte serum-treated C3−/− (b) and wild-type (d) mice. Middle panels, Confocal micrographs of glomerular complement C3 deposition (e–h) in wild-type mouse treated with preimmune serum (g, background) and in a linear pattern in anti-podocyte serum-treated wild-type mouse (h). C3−/− mice demonstrate no C3 immunoreactivity (e, f). Lower panels, Confocal micrographs of nephrin immunofluorescence (i–l) demonstrate equally disrupted nephrin staining in anti-podocyte serum-treated C3+/+ (l) and C3−/− (j) mice. Original magnification ×1000. B, Quantification of albuminuria by albumin ELISA in C3−/− and wild-type mice treated, as indicated, with preimmune (PI, n = 4) or anti-podocyte serum (APN, n = 5) on day 11. Values were normalized against urine creatinine values and are expressed as log × μg albuminurine/mg creatinineurine ± SEM. n.s., nonsignificant. Proteinuria was evaluated by albumin ELISA after 11 d and showed a significant increase in anti-podocyte serum-injected control and C3-deficient mice compared with preimmune serum-treated mice (Fig. 5B). However, proteinuria in C3-deficient mice was not statistically different from control mice. In PAS histology, mononuclear cells were observed in the periglomerular space after injection of sheep anti-podocyte Ab (data not shown). In PHN, an increase in glomerular, periglomerular, and tubulointerstitial T cell number has been reported (18, 30). Therefore, we determined the number of inflammatory cells in the glomerulus and in the periglomerular space by immunostaining with Abs against F4/80 (monocytes/macrophages), MAC-2 (monocytes/macrophages in the glomerulus), CD3 (T cells), and Ly6G (neutrophils) in anti-podocyte and preimmune serum-treated mice at day 14 (Fig. 6A). 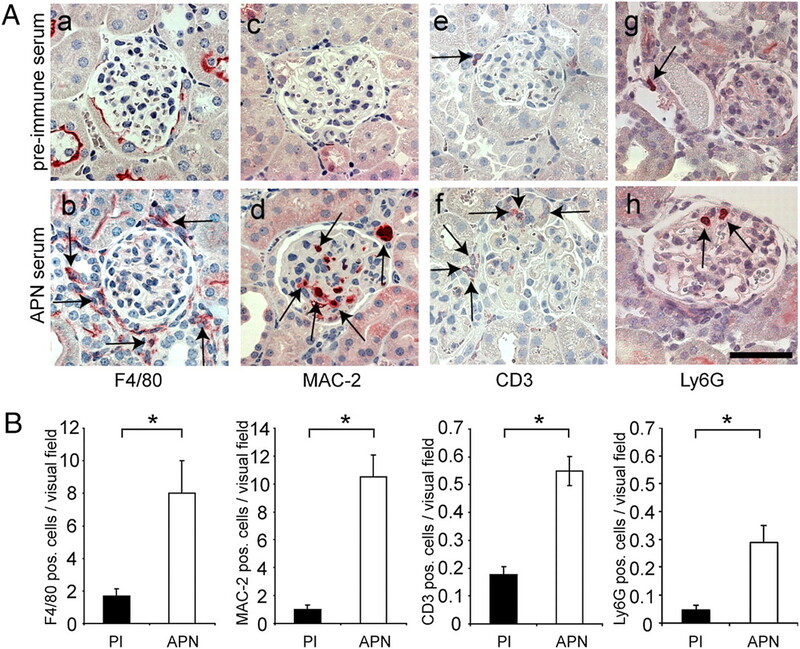 F4/80-positive cells were significantly increased in the periglomerular space, and MAC-2–, CD3-, and Ly6G-positive cells were significantly more abundant in glomeruli of APN serum-treated mice when compared with preimmune serum-treated mice (Fig. 6B). Anti-podocyte serum increases periglomerular and glomerular inflammatory cells. A, Representative immunohistochemistry against F4/80-positive periglomerular monocytes/macrophages (a, b), MAC-2–positive intraglomerular monocytes/macrophages (c, d), CD3-positive intraglomerular T cells (e, f), and Ly6G-positive intraglomerular neutrophils (g, h). The arrows denote positive cells. Scale bar, 10 μm. B, Quantification of F4/80-positive cells (left panel), glomerular MAC-2–positive cells (middle left), CD3-positive cells (middle right), and Ly6G-positive cells in preimmune (PI, ▪) or anti-podocyte serum (APN, □)-treated mice on day 14. Fifty consecutive visual fields at original magnification ×400; n = 3 for each condition and staining. Values are expressed as positive cells/visual field ± SEM. *p < 0.05. Binding of the sheep anti-mouse podocyte polyclonal Ab to paraformaldehyde-fixed, cultured, differentiated podocytes was evaluated by immunofluorescence. Specific staining of podocyte structures was detected along the cell membrane (Fig. 7Aa) with a perinuclear, granular staining pattern (Fig. 7Ab). Podocytes stained with preimmune serum or negative controls without primary Ab did not exhibit any specific staining for sheep IgG (Fig. 7Ac, 7Ad). Ag identification by MS. A, Immunofluorescence of sheep anti-podocyte (a, b) or preimmune serum (c) or negative control (d) on cultured, differentiated mouse podocytes. Double-headed arrows in a indicate a staining pattern of the anti-podocyte Ab along the cell membrane; solid arrows in b indicate additional perinuclear vesicular staining. Original magnification ×630. B, Immunoblot against sheep Ab that reacted with proteins from the eluate of the anti-podocyte serum column (left) or the preimmune serum column (right). To identify weak and strong binding proteins, three different amounts (5, 3, and 1 μl) of the column eluates were loaded, as indicated. C, Protein stainings of 2D SDS-PAGE gels from whole mouse podocyte lysate (a) or column eluate from mouse podocyte lysate (b), which was run over a purified sheep anti-podocyte Ab column. Single dots (indicated with circles) were picked and identified by in-gel digestion and MS. c, List of proteins that were identified by MALDI-TOF in four separate runs from two different sheep anti-podocyte Ab columns sorted by their individual Mascot score. Sheep IgG was purified from anti-podocyte sheep serum or preimmune serum, linked covalently to Sepharose beads, and stacked in a column. After incubation with murine podocyte lysate, the column was washed several times, and the bound proteins were eluted in fractions and separated on one-dimensional and 2D SDS-PAGE gels (Fig. 7B, 7C). The number of specific bands that were detected by anti-podocyte Ab was limited, indicating that possible Ags can be trapped by this method (Fig. 7B). Similarly, protein staining of 2D gels also detected only a few proteins eluted from the column (Fig. 7Cb) when compared with whole podocyte lysate (Fig. 7Ca). The identified spots were excised and subjected to determination by fingerprint mass spectrometry (MS) methods, followed by partial peptide sequence digest. Protein identification used the Mascot search algorithm, and proteins were sorted by their respective Mowse score. By using this method, a total of 20 proteins was identified (Fig. 7Cc) in four separate column experiments. The expression of annexin-3 was further studied in quantitative PCR experiments from isolated glomeruli and whole kidney lysates in APN. Annexin-3 was significantly increased in glomeruli with immune complex nephritis (Fig. 8A). We therefore investigated annexin-3 expression in human podocytes and human biopsy samples from normal kidney and patients with membranous nephropathy. Annexin-3 immunostaining was strongest along the cell membrane of cultured human podocytes and concentrated in podocyte processes (Fig. 8B). In human biopsies from patients with membranous nephropathy, podocytes were more intensely stained than in normal kidney biopsies (Fig. 8C). 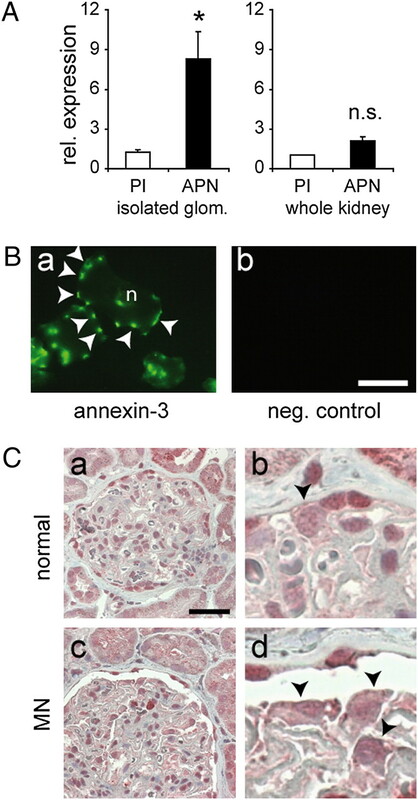 Together, these data indicate increased annexin-3 expression during immune complex nephritis in mice and human kidneys. 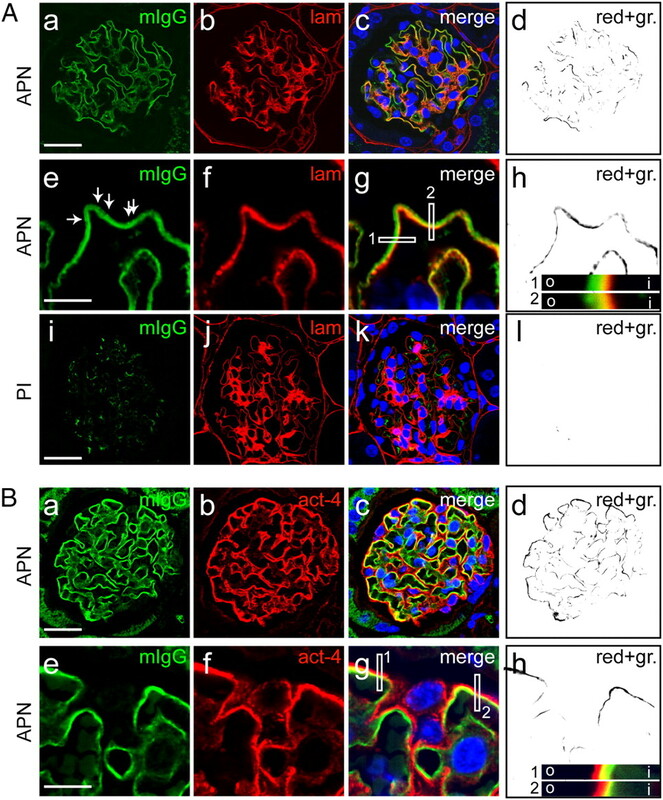 Annexin-3 is upregulated in glomeruli of APN mice and in human biopsies of patients with membranous nephropathy. A, Left panel, Quantitative PCR of annexin-3 mRNA from isolated mouse glomeruli. Similar numbers of glomeruli were isolated using Dynabeads at day 14 after application of anti-podocyte serum or preimmune serum (n = 4 mice each). Asterisk indicates significance. Right panel, Quantitative PCR of whole kidney mRNA from anti-podocyte serum- or preimmune serum-treated mice at day 14 (n = 4 mice each). B, Annexin-3 immunofluorescence on differentiated human podocytes in culture (a) and negative control omitting annexin-3 Ab (b). Scale bar, 10 μm. Arrows indicate podocyte membrane protrusions; n indicates the nucleus. C, Annexin-3 immunohistochemistry of representative human biopsies of a normal kidney (normal, a, b) or a patient with membranous nephropathy (MN, c, d). Original magnification ×400 (a, c) and ×1000 (b, d). Scale bar, 10 μm. n.s., nonsignificant. Subepithelial immune deposit formation induces local inflammation, GBM disruption, podocyte foot process effacement, and nephrotic syndrome in systemic lupus nephritis, membranoproliferative glomerulonephritis, and membranous nephropathy. In membranous nephropathy, the pathogenic mechanism is thought to be a specific Ig–podocyte interaction. The rat model of PHN shows most of the hallmarks of human membranous nephropathy (3, 5). The causative Ab is produced by immunization of sheep with rat-proximal tubule brush border extract (FX1A). The sheep FX1A antiserum then reacts with podocyte foot process proteins such as megalin when injected in rats. However, the mouse or human Ag(s) on the podocyte of idiopathic membranous glomerulopathy remains partly elusive. For this work, we took advantage of the development of murine podocyte cell line cultures (21, 22). We hypothesized that these podocytes express Ags in vitro against which immunized sheep would produce Abs. Administration of these sheep anti-murine podocyte Abs could therefore result in the induction of membranous nephropathy in mice. Indeed, all three sheep anti-podocyte sera induced severe nephrotic syndrome in mice with only marginal differences in morphologic or functional parameters in treated mice. Serum 7319 was chosen because staining on naive kidney tissue was limited to glomerular structures. Immunostainings revealed subepithelial deposits in these mice 7–14 d after injection, together with linear and granular deposition of mouse IgG along the GBM similar to the early deposits in rats with PHN. 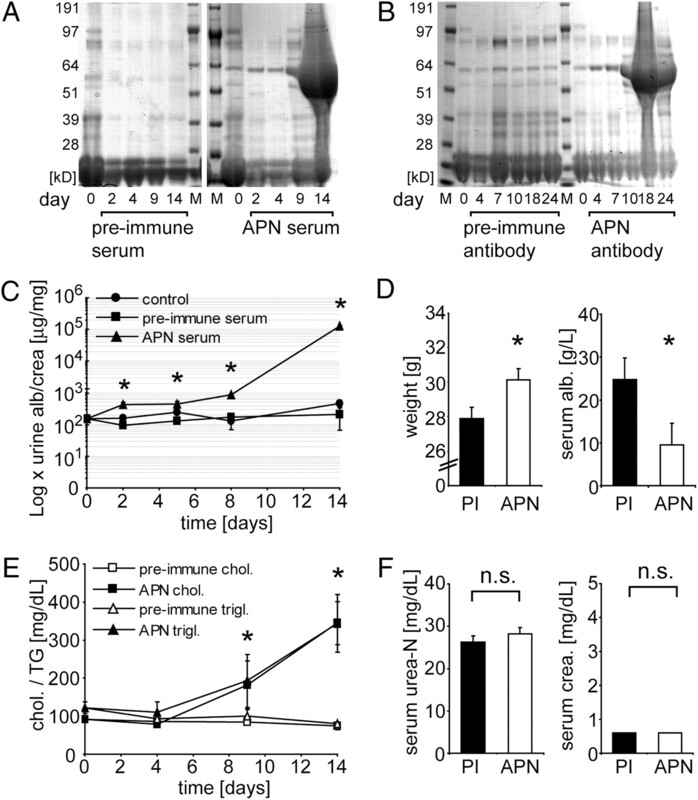 Sheep anti-podocyte serum and purified Ab induced proteinuria in a biphasic pattern without the need for preimmunization, indicating that Ab–Ag recognition plays a major role in the pathophysiology of APN in mice (31). The observed time course was similar to the autologous and heterologous phases of PHN (18, 32). Mice treated with anti-podocyte Ab did not develop elevated serum urea nitrogen or serum creatinine values despite nephrotic syndrome. However, some anti-podocyte serum-treated mice had to be sacrificed before day 14 because of massive ascites. In these mice, serum urea nitrogen was elevated, most likely reflecting acute renal failure secondary to nephrotic syndrome. Upon histopathological examination, the mouse APN showed similar features to those published for rat PHN. Glomeruli in APN were enlarged without crescents, and podocytes appeared swollen. Mesangial expansion occurs in PHN and is thought to result from an increase in cell size rather than cell proliferation (5). Immunostainings showed severe disruption of the slit membrane proteins nephrin and synaptopodin. Electron microscopy revealed podocyte foot process effacement in areas of subepithelial and hinge region immune complex deposits but found the GBM normal. Similar foot process effacement with immune deposit formation preceding the onset of heavy proteinuria is seen in both rat PHN (5) and our murine model. Immunostaining detected the sheep Ab deposited in a linear pattern along the GBM shortly after disease induction. Immunogold electron microscopy localized the anti-podocyte sheep Ab, but not preimmune serum Abs, to podocyte foot processes and to the GBM. Mouse IgG was distributed in a linear and granular pattern in the subepithelial space. Together, these data suggest that the podocyte foot process was the main target of the anti-podocyte Ab, causing the development of mouse IgG deposition and podocyte disruption similar to PHN in the rat. Subepithelial IgG deposition in mice has been reported previously after active immunization with apoferritin (33) or cationic BSA or γ-globulin (34, 35). However, the pathophysiologic relevance of these model systems remains unclear. In our model, the presence of mouse IgG clusters in the mesangial space and endothelial swelling in severely nephritic mice indicates that the mouse model contains additional features that are not typical for membranous nephropathy in rats or humans. The contribution of these histological changes to the induction of renal disease is unclear at present. However, these additional changes coincided with severe podocyte damage and may therefore be secondary in nature. Previously, we have established a similar model with rabbit antiserum against mouse podocytes (20). However, important differences exist between the two models. Preimmunization was necessary for the induction of rabbit- but not sheep serum-induced APN, possibly reflecting the need for further stimulation of the immune response. The biphasic proteinuria occurred only in sheep serum APN, but not in rabbit serum APN. Serum urea nitrogen was initially (day 5) elevated in rabbit serum APN and later decreased, whereas sheep Ab did not elevate serum urea nitrogen despite massive proteinuria. Clinically, sheep serum APN caused complete nephrotic syndrome, whereas rabbit serum APN mice did not increase weight or exhibit edema. Both rabbit and sheep polyclonal Abs induced proteinuria, but only 10–20% of podocyte foot processes were effaced in rabbit serum APN (20). In contrast, sheep serum APN induced 60–80% foot process effacement. Importantly, subepithelial deposits visualized by transmission electron microscopy did not form in rabbit serum APN. The reason for these differences is not clear. However, the three sheep anti-podocyte antisera that were produced for this work induced slightly different pathologies in mice and reacted with different sets of podocyte proteins even though the same podocyte preparations were used for immunization. It is therefore possible that singular Ags are responsible for immune deposit formation and disease initiation. Whereas the presence of infiltrating mononuclear cells is not typical for human membranous glomerulopathy, cytotoxic CD8-positive T cells infiltrating the glomerulus were described in both HN and PHN (18). Furthermore, depletion of this T cell population prevented proteinuric disease in both models, indicating that T cells are necessary for podocyte injury (18, 36). Interestingly, we found increased glomerular T cell numbers as well as monocytes/macrophages and neutrophils in APN mice, as has been reported for PHN (30). It is therefore possible that T cells contribute to APN pathology in a similar way. An interesting report by Bao et al. (37) supports these findings. This group applied anti-podocyte serum into mice that induced focal and segmental glomerulosclerosis (FSGS) in decay-accelerating factor-deficient mice, but not in control BALB/c mice in a T cell-dependent manner. Decay-accelerating factor inhibits complement activation, and therefore their work suggested that reduced complement activation was thought to enhance T cell response to the anti-podocyte serum, resulting in FSGS (37). However, their FSGS mouse model was clearly different from our APN. Bao et al. (37) deliberately chose anti-podocyte serum that would not induce proteinuria in wild-type animals. In our hands, rabbit (20) and sheep anti-podocyte Abs would generally induce heavy proteinuria in BALB/c and C57BL/6N mice. Sclerosis was not observed in any mice. Also, our sheep serum APN was not complement dependent. We acknowledge that complement dependency of PHN in rats had been established in the literature for many years (4, 16, 17). Those studies were carried out with only partial complement depletion by application of cobra venom factor or anti-complement 6 Abs (4, 38) and demonstrated the importance of the formation of the terminal membrane attack complex C5b9 for the development of PHN. However, these studies are now challenged by recent experiments using complement C6-deficient rats that cannot form the C5b9 membrane attack complex (18). C6-deficient rats developed proteinuria and subepithelial deposits in both active and PHN indistinguishable from normal rats (18, 19). Therefore, our results from experiments with C3-deficient mice, which also lack the capability of membrane attack complex formation, are in line with these recent reports. Partial complement depletion with cobra venom factor or anti-C6 Abs might have induced secondary changes that interfered with the inflammatory process at the podocyte. We further investigated whether specific mouse anti-sheep IgG subgroups were induced in APN mice. Mouse anti-sheep IgG1 and mouse anti-sheep IgG2b were increased similarly in both subgroups in the serum, but deposition of mouse anti-sheep IgG occurred only in the glomerulus of APN mice. These findings argue against unspecific mouse anti-sheep IgG deposition, but rather for specific glomerular deposition of anti-podocyte sheep IgG, but not preimmune serum IgG. This specific deposition at the podocyte most likely induced immune complex formation with mouse anti-sheep IgG similar to immune complex deposition in human disease. Differentiation between IgG1-dependent T cell activation and IgG2-dependent complement activation cannot be derived from these data. Twenty proteins were identified in four affinity chromatography experiments, followed by MS, suggesting that multiple Ags rather than a single Ag act to initiate APN. Regrettably, for many of the identified proteins, gene-deficient mice or mAbs are not available for the assessment of their individual contributions to the pathogenic process. However, it is interesting to note that known proteins of the podocyte foot process or the slit membrane have not been found in our analysis. Also, the presently known proteins that can induce subepithelial deposits in rodents or humans such as NEP, aminopeptidase A, or phospholipase A2 receptor (9–11) were not detected. Many of the identified proteins such as annexin-3 and spire-1 belong to the cytosolic or nuclear compartment, with only limited exposure to circulating Abs. Annexin-3 belongs to the annexin family of proteins that bind to phospholipids and plasma membranes in a Ca2+-dependent manner (39, 40). The function of annexin-3 remains largely unknown. The protein is abundant in neutrophils, where it promotes Ca2+-dependent aggregation of phagosome granules (41). Annexin-3 has also been implicated in the regulation of cytoskeletal rearrangement under pathologic conditions and binds f-actin (42). Recently, Endlich and colleagues (43) and our group identified upregulated annexin-3 in podocytes in human diabetic nephropathy. We found upregulated annexin-3 expression also in glomeruli of anti-podocyte serum-treated mice. In human biopsy samples from patients with membranous nephropathy, annexin-3 immunostaining was localized to podocytes and appeared more intense compared with normal kidney biopsies. Together, these data indicate increased glomerular annexin-3 expression during immune complex nephritis in mice and membranous nephropathy in humans. Therefore, annexin-3 could be a new target for Ab-mediated podocyte damage. Spire-1, in contrast, is a neuronal protein with actin-nucleating activity that has also been reported to interact with microtubules (44). Spire-1 was localized to endosomal vesicles, where it may control intracellular vesicular trafficking (45). This function of spire-1 could be of importance in podocytes in proteinuric states such as membranous nephropathy, in which an increase in podocyte vesicular transport has been reported (5). However, spire-1 has not been localized to podocytes yet. It is also possible that the responsible Ag(s) was missed by our current approach. Future use of our model may therefore bring about other candidates for Ab-mediated podocyte injury. In summary, sheep serum APN features potent induction of proteinuria in a biphasic pattern with formation of subepithelial deposits, severe disruption of podocyte slit membrane ultrastructure, and nephrotic syndrome in mice. We thank Dr. Christian Scharf (Department of Otorhinolaryngology, Head and Neck Surgery, University of Greifswald) and Dr. Manuela Gesell Salazar (Interfacultary Institute of Genetics and Functional Genomics, University of Greifswald) for excellent help with mass spectrometry. 1997. Membranous glomerulonephritis. J. Am. Soc. Nephrol. 8: 664–674. 2003. Diagnosis and natural course of membranous nephropathy. Semin. Nephrol. 23: 324–332.
. 1959. Production of nephrotic syndrome in rats by Freund’s adjuvants and rat kidney suspensions. Proc. Soc. Exp. Biol. Med. 100: 660–664.
. 1980. 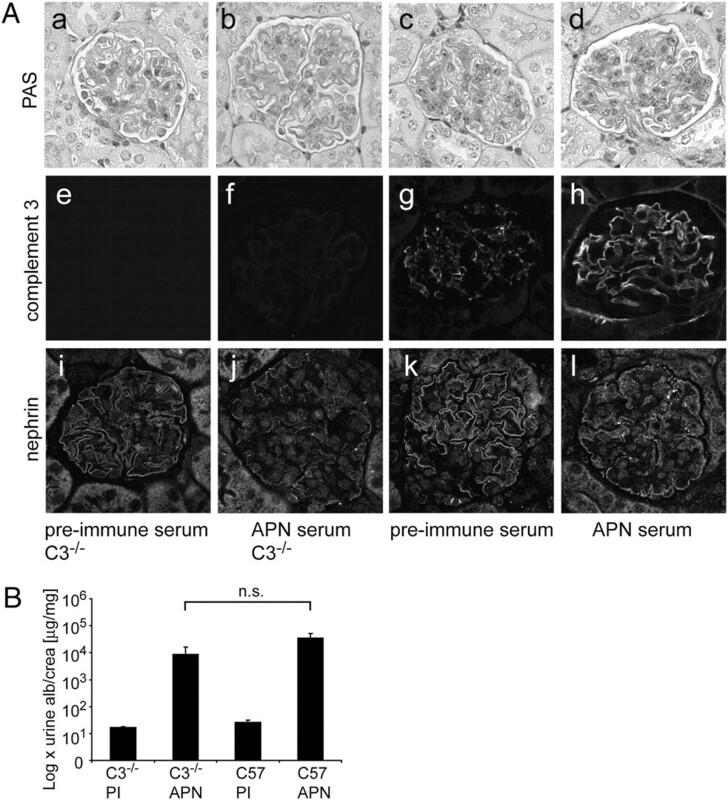 A new role for complement in experimental membranous nephropathy in rats. J. Clin. Invest. 66: 1339–1350.
. 1969. Experimental autoimmune nephrosis in rats: morphogenesis of the glomerular lesion: immunohistochemical and electron microscopic studies. Am. J. Pathol. 54: 47–71.
. 1992. Identification of a pathogenic epitope involved in initiation of Heymann nephritis. Proc. Natl. Acad. Sci. USA 89: 11179–11183.
. 1994. Complete cloning and sequencing of rat gp330/“megalin,” a distinctive member of the low density lipoprotein receptor gene family. Proc. Natl. Acad. Sci. USA 91: 9725–9729.
. 1995. The Heymann nephritis antigenic complex: megalin (gp330) and RAP. J. Am. Soc. Nephrol. 6: 35–47.
. 1989. Antigenic targets in epimembranous glomerulonephritis: experimental data and potential application in human pathology. Appl. Pathol. 7: 85–98.
. 1992. A nephritogenic rat monoclonal antibody to mouse aminopeptidase A: induction of massive albuminuria after a single intravenous injection. J. Exp. Med. 175: 623–635.
. 2009. M-type phospholipase A2 receptor as target antigen in idiopathic membranous nephropathy. N. Engl. J. Med. 361: 11–21.
. 2004. Role of truncating mutations in MME gene in fetomaternal alloimmunisation and antenatal glomerulopathies. Lancet 364: 1252–1259.
. 2002. Antenatal membranous glomerulonephritis due to anti-neutral endopeptidase antibodies. N. Engl. J. Med. 346: 2053–2060.
. 2006. Molecular dissection of target antigens and nephritogenic antibodies in membranous nephropathy: towards epitope-driven therapies. J. Am. Soc. Nephrol. 17: 1772–1774. 2004. Pathomechanisms and molecular basis of membranous glomerulopathy. Lancet 364: 1194–1196.
. 1985. Membrane attack complex deposition in experimental glomerular injury. Am. J. Pathol. 120: 121–128. 1998. Pathogenesis of glomerular damage in glomerulonephritis. Nephrol. Dial. Transplant. 13(Suppl. 1): 10–15.
. 2007. Induction of passive Heymann nephritis in complement component 6-deficient PVG rats. J. Immunol. 179: 172–178.
. 1995. Active Heymann nephritis in complement component C6 deficient rats. Kidney Int. 47: 1604–1614.
. 2007. A new mouse model of immune-mediated podocyte injury. Kidney Int. 72: 841–852.
. 2004. Stable expression of nephrin and localization to cell-cell contacts in novel murine podocyte cell lines. Kidney Int. 66: 91–101.
. 1997. Rearrangements of the cytoskeleton and cell contacts induce process formation during differentiation of conditionally immortalized mouse podocyte cell lines. Exp. Cell Res. 236: 248–258.
. 2002. A conditionally immortalized human podocyte cell line demonstrating nephrin and podocin expression. J. Am. Soc. Nephrol. 13: 630–638.
. 1998. Targeted disruption of the murine gene coding for the third complement component (C3). Scand. J. Immunol. 47: 25–29.
. 2008. CCR5 deficiency aggravates crescentic glomerulonephritis in mice. J. Immunol. 181: 6546–6556.
. 2002. A new method for large scale isolation of kidney glomeruli from mice. Am. J. Pathol. 161: 799–805.
. 2007. Antihypertensive therapy induces compartment-specific chemokine expression and a Th1 immune response in the clipped kidney of Goldblatt hypertensive rats. Am. J. Physiol. Renal Physiol. 292: F876–F887.
. 2006. Compartment-specific expression and function of the chemokine IP-10/CXCL10 in a model of renal endothelial microvascular injury. J. Am. Soc. Nephrol. 17: 454–464.
. 2008. Prohibitin identified by proteomic analysis of prostate biopsies distinguishes hyperplasia and cancer. Cancer Lett. 266: 171–185.
. 1992. The contribution of y-mediated cytotoxicity and immune-complex formation to tubulointerstitial disease in passive Heymann nephritis. Clin. Immunol. Immunopathol. 62: 42–55.
. 2005. Molecular pathomechanisms of membranous nephropathy: from Heymann nephritis to alloimmunization. J. Am. Soc. Nephrol. 16: 1205–1213.
. 1978. Experimental glomerulonephritis in the isolated perfused rat kidney. J. Clin. Invest. 62: 1275–1287.
. 1998. Immune complex glomerulonephritis in C4- and C3-deficient mice. Kidney Int. 53: 320–330.
. 2004. Mouse model of membranous nephropathy induced by cationic bovine serum albumin: antigen dose-response relations and strain differences. Nephrol. Dial. Transplant. 19: 2721–2728.
. 1987. An immune complex glomerulopathy associated with glomerular capillary thrombosis in the laboratory mouse: a highly reproducible accelerated model utilizing cationized antigen. Lab. Invest. 56: 256–263.
. 1998. Permanent CD8(+) T cell depletion prevents proteinuria in active Heymann nephritis. J. Exp. Med. 188: 1775–1784.
. 2009. Focal and segmental glomerulosclerosis induced in mice lacking decay-accelerating factor in T cells. J. Clin. Invest. 119: 1264–1274.
. 1989. Depletion of C6 prevents development of proteinuria in experimental membranous nephropathy in rats. Am. J. Pathol. 135: 185–194.
. 2002. Annexins: from structure to function. Physiol. Rev. 82: 331–371.
. 1994. Annexins: the problem of assessing the biological role for a gene family of multifunctional calcium- and phospholipid-binding proteins. Biochim. Biophys. Acta 1197: 63–93.
. 1990. Purification and characterization of an abundant cytosolic protein from human neutrophils that promotes Ca2(+)-dependent aggregation of isolated specific granules. J. Clin. Invest. 85: 1065–1071.
. 2006. Annexin III implicated in the microglial response to motor nerve injury. Glia 53: 723–732.
. 2009. 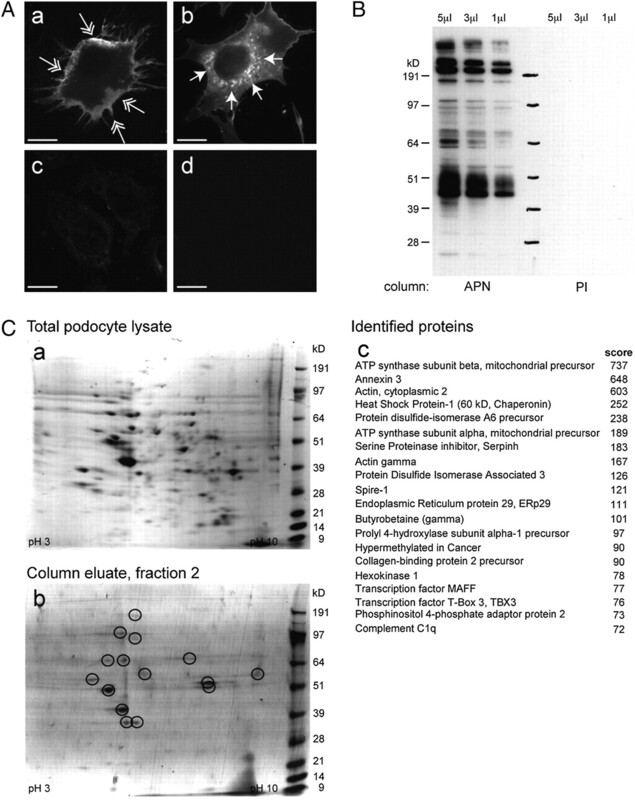 Alterations of the podocyte proteome in response to high glucose concentrations. Proteomics 9: 4519–4528.
. 2006. Coordination of microtubule and microfilament dynamics by Drosophila Rho1, Spire and Cappuccino. Nat. Cell Biol. 8: 367–376.
. 2001. The Spir actin organizers are involved in vesicle transport processes. Curr. Biol. 11: 1963–1968.